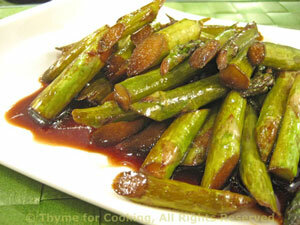 Asparagus with Soy and Balsamic, Thyme for Cooking easy spring side dish. This is a quick stir-fry; the asparagus should be crisp-tender, lightly browned and slightly blistered. Serve hot or warm. Snap off ends of asparagus. Roll cut asparagus in 2 inch (5 cm) lengths. When very hot add asparagus and stir-fry 3 minutes. Add soy sauce, vinegar, and stir-fry another 30 seconds.